Kevin has been in our family since he was born, we got him when he was rising 3. I have done and continue to train him in Dressage. He raced in 2 starts, and showed to us that he loves to be a dressage horse and be pampered and loved, instead of running around a racetrack. Kevin, has a supa doopa nature and a very gentle disposition. Kevin, has been put over some small jumps and he likes it. Kevin, is a good doer, he does not need a lot of feeding. He has good feet. He has a nice simple snaffle mouth, and tends to carry himself in a nice round frame whilst in training. Kevin is a clean slate for a potential super future in dressage, I believe he has the temperament to compete under the pressured environment at big events. A real honest, luving horse. He needs a very good home, someone to luv him for a long long time, $8,000, he is sound in every way. 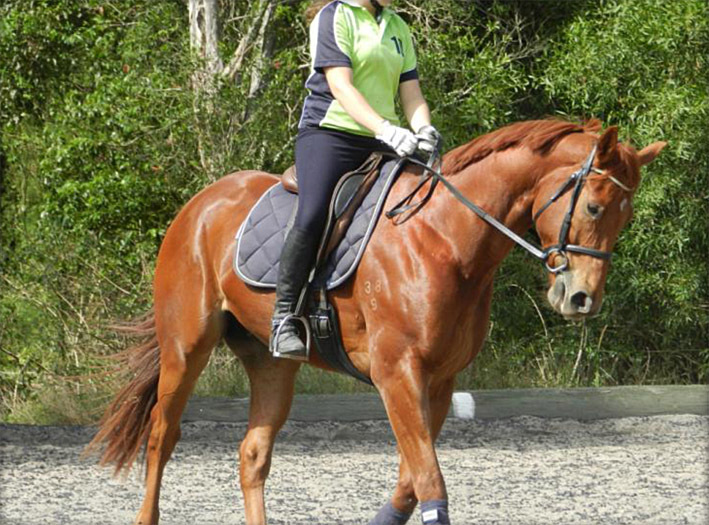 A fantastic young rider horse. This entry was posted in Pete's racehorses on 21/12/2013 by Sally.